Hospice and Palliative Medicine and Supportive Care Flashcards is a comprehensive, evidence-based book of flashcards for clinicians caring for patients who require hospice and palliative care and supportive care. Written in a clinical scenario/vignette, question and answer format by experts with first-hand experience in the field, the flashcards are highly readable and serve as a source of fast answers to clinical questions in the field. 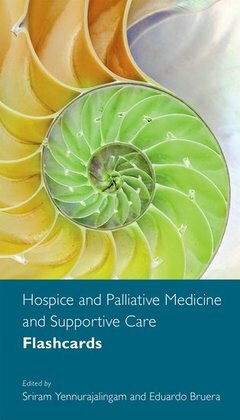 A total of 300 flashcards are organized into chapters by symptom/disease and provide readers with up-to-date information that follow the core curriculum of American Board of Hospice and Palliative Medicine for ease of use and rapid review for exams. This book will equip care professionals with key concepts related to the assessment and management of palliative care, making it an ideal point-of-care quick reference material for physicians, nurse practitioners, fellows, residents, and students. Sriram Yennurajalingam is Associate Professor of Palliative Care and Rehabilitation Medicine at The University of Texas MD Anderson Cancer Center.Eduardo Bruera is Professor and Chair of Palliative Care and Rehabilitation Medicine at The University of Texas MD Anderson Cancer Center.